You can't easily get a pound of chocolates here because it is primarily a restaurant, but they make chocolates in Boulder and I had to seek them out and try them. It is one of the best restaurants I have ever enjoyed. They specialize in applying high end cooking techniques to local ingredients with unbelievably delicious results. I will admit I carry similar high expectations for their chocolates. As I write this I realized that none of their chocolate ingredients are local so it is not fair to expect totally spectacular results. When you order the dessert plate it features six chocolate items, but, because I got mine to go, I missed out on the Mint Chips. For more details on the restaurant itself see their home page at www.frascafoodandwine.com. The chocolates are listed below in the order I would eat them. You should know I always save my favorite items for last. Peanut Butter - (Top left in picture) - I did not have the flavor list with me when I first tasted it and I got it wrong. That is usually a bad sign. While tasty it lacked distinction. The flavor just did not seem peanut buttery. Admittedly I may carry some biases. Reese's peanut butter cups are burned into my mind as an ideal. I also had a peanut butter chocolate made by Ethel M that "tasted like cardboard," to quote a wise soul I know. I think peanut butter is just tough to do in a chocolate. However I will try it again someday and see if I think differently. Mocha - (Purple foil) - This milk chocolate dome with a truffle filling has a dense texture and a rich chocolate taste that coated the roof of my mouth as I let it melt. It is good, but if I had a choice I would try and order two each of the following items. Passionfruit-Caramel - (Blue foil) - This was a fun chocolate because of the exciting flavor combination. I nibbled at it though and that might not be the best way to eat it. This summer I met a bittersweet chocolate caramel, made by Sahagún in Portland, that was best eaten by popping it whole in your mouth and letting the flavors explode. I plan to go back and try that with this delicious caramel. Nibbling let too much of my focus be on the milk chocolate shell and not enough on the caramel filling. 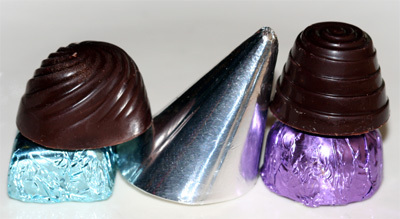 Coconut - (Silver cone) - My first favorite part of this chocolate was unwrapping the foil and having a burst of rich, dark chocolate aroma hit my nose. It almost made me want to wrap it up again just so I could open it. My second favorite part was having lots of a smooth, delicious coconut cream filling. I was able to make this chocolate last a long time and thoroughly enjoy the combination of flavors. Valrhona 70% Bittersweet - (Top right) - This is my favorite type of filled dark chocolate. The first small bite wrapped my whole tongue in dark chocolate flavor. The inside is a rich dark chocolate cream which melts beautifully in your mouth. I wonder if I will wind up using "dark chocolate" in all sentences in this section. If you find yourself in Boulder I highly recommend this restaurant if it is your price range. Be sure you make reservations or show up at 5:30 or 7:30 for a chance at one of the walk-in seats. There you can try these chocolates or their other indulgent chocolate desserts.